← ‘All she ever knew was America’: This high school athlete had a plan. Then DACA was rescinded. The Vice President of Bolivia’s Movement to Socialism Party, Gerardo Garcia, said that President Evo Morales will run for reelection, “no matter what” in 2019. 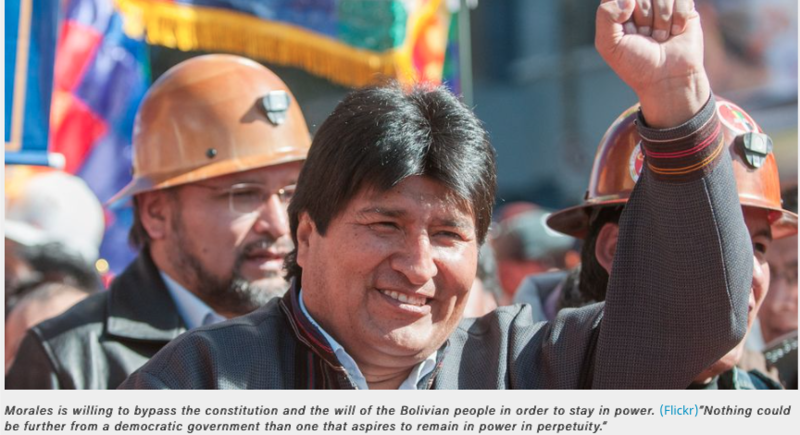 That means Morales is willing to bypass the constitution and the will of the Bolivian people in order to stay in power. The opposition has said that a win by Morales in 2019 could lead to an indefinite hold on power. Thousands of people have already taken to the streets to protest, reminding Morales that the opposition already rejected a constitutional referendum for his reelection bid. Before the opposition demonstrations, Morales began his campaign with a series of marches. “Our social organizations are demonstrating that they are going to make a massive turnout in the different departments of the country,” Garcia said. Additional protests will begin Thursday, October 26 in Cochabamba, then in Sucre and other parts of the country. Polls show that most people in urban areas want to see Morales’ time in office come to an end. Additionally, most Bolivians have said they don’t want an amendment to the constitution. 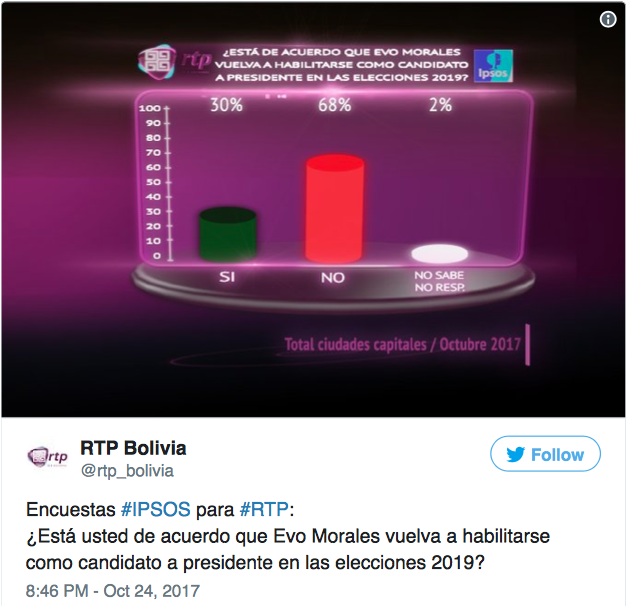 A survey conducted by polling organization Ipsos said the majority of people — 68 percent — reject the idea of Morales returning in 2019. Ipsost also said approval for Morales’ administration fell from 58 to 57 percent, while disapproval grew from 34 to 39 percent over the last 12 months. Even so, MAS seems prepared to go against the will of the Bolivian people, distorting “the bases of legality and legitimacy” as explained by lawyer and former Minister of Justice, Carlos Alarcón. For now, the Plurinational Constitutional Court (PCT) is expected to rule on a lawsuit filed by MAS that seeks a declaration of “inapplicability” to some aspects of the Magna Carta, in hopes that Morales can run in indefinite elections without protest from the opposition. The PCT has until next December to make a ruling on the issue. “In his personal project to maintain power, the president demonstrates a profound lack of respect for the will of the people,” political analyst Carlos Valverde Bravo said. Bolivian Thoughts opinion: The coca grower caudillo has lost his marbles … the only thing he did was to travel constantly over the last eleven years he was in perpetual political campaign, inaugurating soccer fields, stepping on the responsibilities or activities of the Governors or Mayors, nationwide. Giving money away without accountability and of course without sound judgement, just buying “loyalties” so the egocentric delusional “caudillo” would remain in power. Instead, blooming narcotrafficking and smuggling, topped with blockades, riots, in sum anarchy rules Bolivia. This entry was posted in Bolivia, Politics, Social Unrest and tagged corruption in public office, demagogue, democracy in peril, government failures, public policy failures. Bookmark the permalink.